Dog Gone Cute Grooming, Inc. I brought my “baby girl” Gretchen in for a grooming in mid January. Actually Gretchen is 13 years old. It was our first experience with your shop… I am sold totally! I explained how I wanted her groomed and when I picked Gretchen up she looked amazing/beautiful. Plus she was not stressed, just totally happy! I will certainly tell all my friends/family to take their little one’s there also. Staff is wonderful and loving to all the animals, I personally witness hugs and kisses being given freely. I am so happy I found this wonderful grooming shop. When I first found Dog Gone Cute grooming I had 3 mini schnauzers. Egypt was 16 years old and the brothers Dash and Coco were 1 year old monsters. Jason and Morgan were their groomers. My dogs, ESP the fussy old man, were treated so sweet. Egypt has since passed away so now I’m down to 2 boys. These pet lovers know my boys are like my children and they show how much they love making us mommies happy. Thank you Dog Gone Cute for taking good care of my babies. *******All Of the reviews speak for how we pet owners feel!!!! Hamilton LOVES coming here! They are always flexible with our crazy schedule, professional and clean! I always know my doggie is in great care when coming here!! Austin and Savannah look great after their visit yesterday! We will definitely be back. We love taking our dog Charlie here! They always take great care of him! 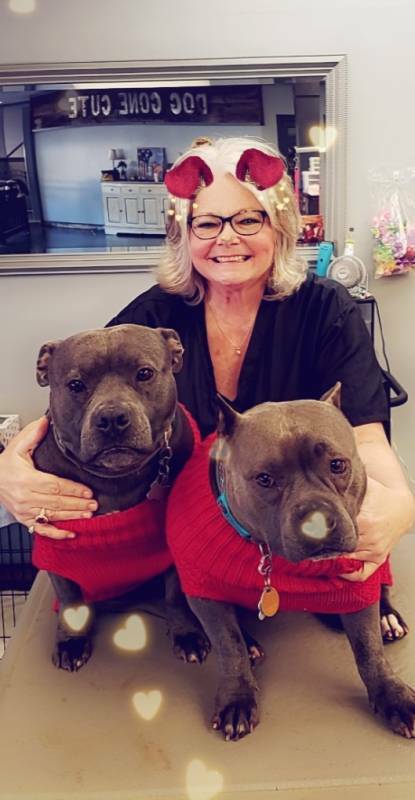 I have been taking my dog Casey to Dog Gone Cute Grooming for 2 years now, Morgan does a wonderful job and is always so patient with my dog. The staff is extremely personable and the place is very friendly. I would highly recommend anyone looking for a groomer to take their fur babies here, you won’t be disappointed. I just picked up my very troubled, rude little mutt from Morgan. He did a fantastic job. The previous vet couldn’t even get near my dog without sedatives, but Morgan took the time to really listen and take care of my little pupper. This place is the best groomer around, and I’m saying that as someone who drives from Atlanta. My Goldendoodle, Charlie, has been getting groomed at Dog Gone Cute by Morgan for 2 years now. Morgan always does a wonderful job and Charlie is always excited to see him! Morgan has the best personality and an eye for detail. The facility is clean, spacious, and you can really tell they love dogs here. Charlie and I are also taking a best manners class on Friday nights here through an independent dog trainer. Charlie immediately felt comfortable because he is familiar with the facility and has great memories of the place! Since moving from FL four years ago I tried a few groomers, but finally found Dog Gone Cute and I’m happy I did. I love the way they take care of Sara and Maggie and the beautiful grooming. Everyone is friendly and caring about the “girls”. They even let me know if they see anything I should keep an eye on regarding their coats, ears, or eyes. DGC is the best!! This my princess. At Dog Gone Cute Grooming she will pampered and babied. She has gotten the best trim and bath and I have taken her to several other places and they do not take as good care as Tonya’s staff does. Thank you. My little companion, Squeaky, is four years old. He weighs 2 lbs. 2 oz. He had his first visit at DogGonecute a week or so ago. This is the best groom and hair cut he has ever had. He looks so cute! I’ll be back soon. I stumbled across Dog Gone Cute Grooming via Kudzu yesterday after my Cocker Spaniel puppy had been groomed by someone else and it wasn’t quite to my liking. I was looking for someone who could fix her up ASAP and noticed that although DGCG was nearest to my home in Braselton, they had no reviews. I didn’t really want to make my dog a guinea pig and test a brand new business, but their website was well put together, and the prices seemed reasonable, so I gave them a call. Danielle apologized and said she didn’t have time that day, but I could bring her in the following morning. Google Maps took me twenty minutes out of my way to Jefferson, for some reason. When I realized the error, I called Danielle to say I would be late and she was completely understanding. Truly, a pleasant person to work with. When we finally arrived, I was thrilled to see another Cocker Spaniel on the grooming table who was coming out quite nicely. Danielle took the time to look at my photos and listen to my long-winded explanations of what I was hoping for, and then she took my girl behind the counter to play with the other loose dogs in the salon. I was told if they play well with others, they don’t have to be crated, which is obviously less stressful for them! Two hours later, I had a much prettier puppy back FREE OF CHARGE. That’s right. You read correctly. She said because all she did was fix up a previous groomer’s job and didn’t give a full groom, it was no charge to me. All I owed her was the opportunity to have her groom my Cocker again in six weeks. I’m sold. We’ll see you again in May/June, Danielle. And we look forward to meeting Tonya, the owner, as well!